The College is governed by Council and a series of topic-specific Committees which range in focus from finance and heritage to strengthening our international links. Our Committee structure ensures a wide range of experience and skills are brought into the College's decision-making processes. This high level group is chaired by the President. It meets three times a year and discusses current issues affecting the College and makes recommendations for action. The Education Strategy Group supports the Director of Education in developing and delivering the education strategy. Discussion ensures all strands of education are integrated and that there is appropriate and affordable education available to meet the needs of Fellows, Members and Associates of the College. To ensure that equality and diversity are placed at the centre of all our business, we have established a dedicated Equality, Diversity and Inclusivity Group which will champion our values throughout the College and across our community. This Committee is chaired by the Director of Examinations and meets annually to review the previous year's activity in MRCP (UK) Part 1; Part 2; Clinical (PACES) and Specialty Certificate Examinations both in the UK and internationally. The Committee also discusses future planning and strategy. Key responsibilities of this Committee include assessing nominations for Fellowship and making recommendations to Council. It meets five times each year and is chaired by Dr Deepak Dwarakanath, Vice President. Chaired by the Treasurer, this Committee reviews and reports on financial affairs of the College and meets four times each year. This group meets four times a year and is chaired by the President. Group members represent a number of health professions and the group work collaboratively with external organisations, such as those in the voluntary sector, in order to promote mental and physical health and wellbeing initiatives. The International Development Group is chaired by the International Director and meets twice a year. It is responsible for delivering the College’s International Strategy, promoting the College's international initiatives and raising standards of healthcare wherever in the world our Fellows and Members practise. This Committee is a valued and highly respected part of the College governance framework. Chaired by Maureen O'Neill, it meets four times a year and provides a lay perspective on College policy and strategy. Chaired by the Honorary Librarian, this Committee meets twice a year with a remit to oversee the library. Meets twice a year to dispense grants and bursaries according to the purposes of the Myre Sim fund. It is chaired by Professor Ian W. Campbell, who is appointed by Council. 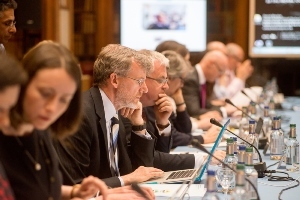 The Recently Appointed Consultants' Committee meets three times each year and ensures the views of recently appointed consultants are represented in relation to on-going needs in professional development and education. It co-ordinates and provides support for Recently Appointed Consultants, within and outside the College. The SAS sub-committee was formed in 2011 to ensure that Staff Grade and Associate Specialist (SAS) doctors are represented within the College. Recent statements to Council have covered issues such as SAS Doctors as Educational Supervisors and progression to Fellowship for SAS Doctors. The Trainees and Members’ Committee is a representative Committee of elected Trainees and Members (post-MRCP(UK)), Associates (pre-MRCP(UK) and e-Associates (medical students and Foundation Doctors) of the RCPE. Our principal concern is to provide support for Trainees and to ensure that the views of Trainees are represented in all RCPE discussions and in external related discussions, such as within the Joint Royal Colleges of Physicians Training Board (JRCPTB).